Over the last several years the patent allowance rate has fallen from about 70% of applications becoming patents to a low of 42% of patent applications becoming issued patents. During this same time the Patent Office has continued to proclaim that quality has risen, which everyone in the industry knows to be false. The real tragedy is that the Supreme Court was supposed to have solved the problem of stupid patents with its decision in KSR v. Teleflex. I am not a fan of the Supreme Court’s ruling because obviousness is now based on common sense, which means we might as well be back to the requirement that an invention display a “flash of creative genius,” which was specifically legislated out of the patent laws in 1952. But if the Patent Office really has achieved unprecedented quality, and the Supreme Court has staked the deck against those inventions that are just ordinary, uninspired and not new, then we should not have stupid patents issued any more, right? Think again! At a time when many start-up companies cannot get patents issued and are unable to attract investors, not much has changed on the silly invention front. From time to time it is fun to take a look at some issued U.S. patents and consider what, if any, effect the Supreme Court’s decision in KSR v. Teleflex has on what the Patent Office is now issuing. At least as far as the Patent Office is concerned the uproar surrounding the KSR decision seems to be much ado about nothing, or perhaps I should say insofar as silly patents are concerned KSR and alleged quality reforms at the USPTO has done little regarding silly patents. Take this patent, U.S. Patent No. 7,263.754, for example, which issued on September 4, 2007. It is for a Truck sleeper, which covers a method for making a longer truck sleeper unit. Then there is the upright vacuum cleaner, US Patent No. 7,313,845, which issued on January 1, 2008. Put aside for the moment that while we were all recovering from holiday celebrations that the Patent Office issued a patent on a national holiday. How is this invention not within the common sense of, well everyone? If you read the patent and dissect the claims it seems that the inventive contribution to the field is that this particular vacuum cleaner has 2 power switches. How about garments having inside out appearance, US Patent No. 7,350,242, which issued April 1, 2008. Yes, that is April Fools Day in 2008. You just can’t make this stuff up! Reality is far stranger than fiction could ever dream. What about a food container and bib, US Patent No. 7,360,256, which issued April 22, 2008. One of my personal favorites is a carry-out food container, US Patent No. 7,451,889, which was issued on November 28, 2008. It seems the innovation here is that the piece of wax paper is pre-attached to the container. So if you take a well known carry-out food container and attach a piece of wax paper you could be infringing. This is offensive beyond words, particularly given that real innovations and inventions are held hostage at the Patent Office and never receive patents. Another personal favorite of mine is the finger mounted insect dissuasion device and method of use, US Patent No. 7,484,328, which issued on February 3, 2009. In light of the Supreme Court’s decision in KSR can anyone tell me how any of these are patentable? Aren’t all of them obvious? How is it possible that these are not within the common sense knowledge base of someone of skill in the art? How are these not obvious to try, which after many years of not being the appropriate test is unfortunately the test that the Board of Patent Appeals and Interferences applies. I don’t mean to beat up the Board, I think that they are right. As a result of KSR the test should be is an invention obvious to try, and if it is then no patent should be awarded. But why didn’t the Patent Office apply KSR or quality review in these cases? If these patents are awarded then patents should be awarded based on every application, otherwise there is an equal protection argument because similarly situated applicants are being treated differently, and that is unconstitutional. How many of these “inventions” were filed by pro se inventors rather than corporate entities? I have always believed that pro se inventors get more of the benefit of the doubt. Who wants to turn away the person who has put his life savings into a project? And doesn’t the PTO advise examiners to “assist” pro se applicants? All but the vacuum cleaner were individual inventors and the fly swatter was pro se. It seems to me that identifying and attacking “dumb” or “crazy” patents will yield the result of further entrenchment by the PTO in its current policies. The core problem is that the public simply does not understand the standard for patentability -is new and non-obvious, and not innovative and brilliant. As a former Examiner, I learned quickly that the quality of the idea being patented was irrelevant because it has nothing to do with the legal standard. 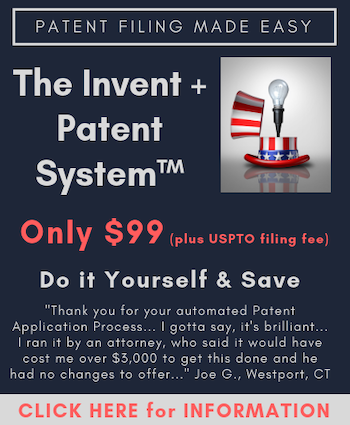 I often tell people that it is easier to patent a stupid idea than a good idea because people generally do not spend time and money publishing and patenting stupid things that are unlikely to make money, while good ideas are usually incremental improvements in a crowded field. Your post seems to suggest that stupid=obvious. This is a populist sentiment, but not transferable to actual examination. Without prior art to rely on, even the stupidest idea passes the novelty test and often the obviousness test because it is generally not obvious to do something that does not present any meaningful improvement. Often, the stupid patents are inelegant, inefficient, and/or more complex ways of doing things already done better or things that no rational person would do. For example, U.S. Patent No. 6,055,910, issued by a friend of mine at the USPTO, is essentially a fart-powered methane toy rocket. Believe me, the Examiner did not want to issue this patent. She did not want her name on it and worked diligently to thoroughly examine the application and find good art. There simply was not any art that covered the claims, and she was forced to allow the application because it met the legal standard for patentability. Her failure to do so would have been discriminatory and extra-legal. Also, with enough limitations in the claims, such as dimensions and relative placement of particular parts, a skilled attorney can get just about any mechanical device allowed. Notice that simple mechanical patents account for the vast majority of easily-identifiable and risible patents because they are easy to understand. As long as the PTO keeps chasing quality based on stupid patents trumpeted by the press and public, the core problems in the PTO will never be solved, because the legal standard for examination does not and should not try to judge the quality of the idea, only the novelty and non-obviousness of the idea. What the PTO should do is simply say that they don’t judge the marketplace value of applications, only the novelty and non-obviousness. And that it is the job of the marketplace to determine the value of any given patent. After all, the simple reality is that stupid patents are meaningless because they will never be enforced. If I claim to own the planet Venus, why would anyone spend time or energy fighting me legally about my claim? It is meaningless. My ownership of Venus, even if established by US law, would not affect me or anyone else in any legitimate, meaningful way. The same is true of owning any worthless property, whether in the Nevada or Utah desert, on Venus, or Intellectual Property. I appreciate your comments. I don’t mean to imply that stupid is obvious. I probably need to write up something in detail about that. I also think you are right, that stuff like this could lead to greater entrenchment. I think a part of the problem was that in order to stop bad, stupid, obviously obvious patents the PTO took a hard line. That hard line, however, has affected real inventions far more than the bad, stupid, obvious patents. There are more every week despite KSR and despite two-eyes requirements and the PTO wanting more rejections. What I am trying to show here is that despite all of the talk of quality the bad patents they want to stop keep issuing, but at the same time real innovations are not resulting in patents. Eventually the Patent Office needs to realize that going after these patents is never going to stop them, but will cripple innovation and hence the US economy. Take a look at the claims for the vacuum cleaner patent. What is talked about in the Abstract seems interesting and useful and perhaps even new, but what is in the broadest claim can’t be unobvious in light of KSR. Adding an extra on-off switch has to be obvious under KSR, else nothing is obvious. If you are interested in writing your thoughts into a full article, perhaps building on this comment, I would be happy to publish it. I understand your point about showing that the PTO is not succeeding at accomplishing their stated goal. As I said above, the problem is that the law did not provide them the tools for eliminating stupid patents. It is dangerous to insist that the obviousness tool, even with KSR, could be used to reduce stupid patents. A wrench is not a screwdriver. Let me take up your vacuum cleaner patent. Why is it obvious to add two power switches to a vacuum. Why would anyone do that? Is it obvious to do something no rational person would do? The irrational designs are generally non-obvious because they aren’t the kind of thing one of ordinary skill would do, or would even think of doing. Thus, any obviousness argument for such devices is simply improper hindsight reasoning. Simple is not the same as obvious. Rearranging known parts can also be patentable, as long as the arrangement is novel and non-obvious. Also, in a well-developed market, like for vacuum cleaners, the fact that such a thing is novel (assuming there was no prior art suggesting two switches), tends to indicate that it is not obvious to one of ordinary skill. Otherwise, in the many vacuum patents and publications, someone is likely to have at least mentioned the possibility of two switches. In other words, just because we all understand very clearly that you can add a second power switch to a vacuum, doesn’t mean it occurred to anyone before this guy did it. If there is no evidence of it ever having even occurred to anyone previously, how can it be obvious? Which goes back to my original point – paying attention to the stupid patents is counterproductive to the goal of improving the patent system. We shouldn’t be trying to eliminate the stupid patents because they are worthless. Just ignore them. It’s like a cat chasing a light on the wall (a patented method by the way), it expends a bunch of energy with no real result. F. Chad is right, overall. The “stupid” applications are often the hardest to reject because there is no reasonable rationale to make the modification. Even with KSR, if applied correctly, an examiner can not just say that it would have been obvious and leave it at that. There still needs to be some rationale to make that modification. And, as F Chad points out, & you seem to agree with in the post above, the public (e.g., the blogs & bar) harping on these “stupid” patents does nothing but make the PTO look bad and just reinforces management’s (Doll, Rolla, Love, etc.) concept that we are issuing too many “bad” patents and need to be rejecting more cases. If you all are to criticize issued patents, it would be a better reflection of what is being done if the emphasis were placed on “not-stupid” patents. If we issue something that reads on the ipod and was filed 2 years ago THAT is something that should be jumped on. Not a basically worthless patent filed by a independent or pro-se. Now, I DO agree that the “reject = quality” mentality is completely wrong. The emphasis in reviews (i.e., from OPQA) should be much more on IPR cases (non-finals & finals – IPR) rather than allowances. However, the office reports to congress the allowance error rate & the IPR error rate is something that gets very little pub. It needs to be the other way around. And the way to increase BOTH IPR and allowance error rates is to do better 1st actions. THAT is where the emphasis needs to be put. Suppose a group of dodgy lawyers, who own a stupid trousers patent, make a claim against a small company that make trousers for example. The patent has nothing to do with the small company’s business. The small company are told the minimum cost to now do anything, whether they defend themselves or not, is $2milion. The small company might have, say $100 thousand. What can you do? The dodgy lawyers have a win-win situation. The small company will be destroyed and their livelihoods destroyed because of some greedy thieves who happen to be protected by law.